the evacuation of the Vietnamese Naval Base. approaches to the Dong Ha bridge. On April 5, with Commodore T.R. Johnson, ComDesRon 31 embarked, BUCHANAN led an operation against North Vietnam. On the afternoon she fired the first rounds into North Vietnam since "Sea Dragon" operations creased in 1968. Oklahoma City, USS Richard B. Anderson and USS Hamner. BUCHANAN retired to Danang for battle damage repair. carrier, USS Kitty Hawk, BUCHANAN returned to the gunline. off Haiphong Harbor since operations were initiated of April 5. On April 17, 1972 (the same day as Buchanan was Hit) an article was published in TIME Magizine on her part in the Viet Nam War. Shelling Viet Nam targets At approximately 0358 in the morning of 25 August 1972, the familiar report of Buchanan's 5"/54 guns was heard as it delivered a salvo of rounds on an antiaircraft site located just off Route One in the vicinity of Hon La Island, North Vietnam. This salvo was not unlike many that had preceded it, but it marked a milestone in a most eventful cruise for the Guided Missile Destroyer USS BUCHANAN (DDG-14). 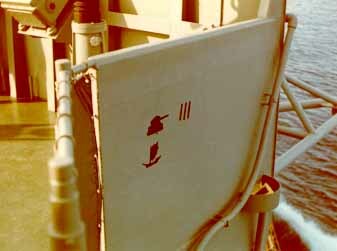 This salvo marked the 15,000th round shot by BUCHANAN's guns since arriving off of Vietnam in March of 1972. USS Buchanan Strikes Back ! Buchanan was credited with at least six confirmed tank kills, four 82mm mortars put out of action, plus the destruction of numerous other targets. She received over 1000 rounds of hostile fire. by BUCHANAN's guns since arriving off of Vietnam in March of 1972.
gunfire support for the defensive stand by the South Vietnamese at Dong Ha. She was credited with numerous enemy killed as well as significantly assisting in delaying the NVN invasion of Quang Tri Province by three weeks. laying aircraft and was one of the two destroyers in the first multicruiser destroyer strike since World War II conducted at the mouth of Haiphong Harbor. In all, BUCHANAN participated in four strikes at the mouth of Haiphong Harbor, a record no other US warship has equaled. She steamed up and down the coast of North and South Vietnam for five and a half months, her guns hammering at SAM sites, troop concentrations, supply routes and coastal defense sites, as well as conducting overt surveillance of merchantmen attempting to off load supplies into North Vietnam. South of the DMZ, she was credited with at least six confirmed tank kills, four 82mm mortars put out of action, plus the destruction of numerous other targets. She received over 1000 rounds of hostile fire. The above picture of Buchanan is from the 72 cruise book. Notice the "battle eyes on the bow". Picture to left is of Starboard bridge wing with four tank kills and fishing boat was taken by BT2 Samuel Camp. When we pulled in to Hong Kong before returning to San Diego there were six tanks. The Chinese government protested about them and they were painted over with in hours of entering port. When the North Vietnamese got good at hitting us we switched to night strikes so they had to light us with star shell to see us (most of their guns were not radar controlled). After several nights they sent a small craft out with large spot light to back light us for guns. We did not think this healthy so we used 50 Caliber to shoot out light and sink boat. MORE TO SAY TO THE ENEMY. UNQUOTE. 2. WE ALL JOIN BUCHANAN MEN IN MORNING THE LOSS OF YOUR SHIPMATE. THE ATTACK. OFTEN GOING IN HARM'S WAY, YOU HAVE DEMONSTRATED THE COURAGE AND SKILL THAT FIGHTING MEN OF THE RESPECT SO WELL. MY CONGRATULATIONS ON YOUR OUTSTANDING PERFORMANCE IN COMBAT ACTION. REPAIR AND RETURN TO US SOON. SUPERIOR PERFORMANCE AND SPIRIT OF BUCHANAN MEN AND IS A TREMENDOUS SOURCE OF INSPIRATION TO ALL OF US. TO A SUPERB FIGHTING SHIP AND HER OUTSTANDING CREW SEVENTH FLEET SAYS WELL DONE.